All breeding colonies are subject to genetic drift. However, there are a number of colony management strategies that can limit drift, and therefore limit the effects of drift on experimental reproducibility. These strategies include use of proper nomenclature, thoughtful breeding practices, and cryopreservation. The following are some best practices to employ while maintaining a mouse colony. Use full and proper mouse strain nomenclature to remove uncertainty and allow identification of the exact substrain that is being investigated. For daily colony management, use colored, preprinted labels with full nomenclature, including substrain designation(s) on cage cards and in lab notebooks. Preprinting the labels reduces penmanship errors and improves nomenclature compliance. Use of differently colored labels or cage cards is especially important in busy, shared spaces where strains of similar nomenclature and appearance may be housed nearby. In publications and grant proposals, use full nomenclature including substrain designation(s) the first time the strain is mentioned. Define how the strain will then be abbreviated in the text and figures (“hereafter referred to as…”). In the methods section, use full nomenclature and substrain designation(s). Identify the source of the strain such as lab name, institute, or vendor and catalog number of the strain. Include generation numbers and breeding schemes employed (see below). For further suggestions, consult the ARRIVE guidelines (nc3rs.org.uk/arrive-guidelines). Inbreeding allows for faster identification of deviant phenotypes in a colony. Pedigrees allow affected and potentially affected inbred mice to be removed easily (Figure 4). Generation numbers allow quick identification of potential risk of genetic drift in the colony. Figure 4. Maintaining a pedigreed colony. Only mate sister- brother (circle-square) pairs or trios in 2 or more pedigrees (light blue vs dark blue), never mixing breeders from one pedigree with the other. 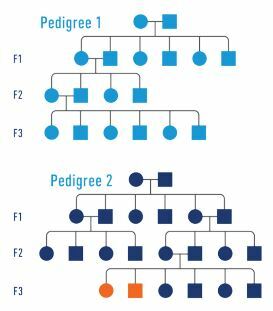 If aberrant phenotypes (orange) arise in one pedigree, affected individuals are more easily identified and removed. The unaffected pedigree (Pedigree 1, light blue) can then be divided into 2 new pedigrees, without losing time rebuilding the colony de novo. Inbreeding – only mate brothers and sisters. Pedigrees – record dam (female) and sire (male) used in each breeding. Keep 2 or more pedigrees within a colony, never mixing breeders from one pedigree with another. For example, “N6F12+F8” refers to a strain that was backcrossed 6 times, filial mated 12 times, and transferred to another laboratory where it was filial mated 8 more times. Given that substrains arise in 20 generations of consecutive inbreeding and genetic drift has likely occurred, it would be wise to refresh the genetic background of this example colony. In addition to breeding practices, strains should regularly be observed for any changes in phenotype. Where genetic drift is concerned, “changes in phenotype” can mean anything observable or measurable: appearance, behavior, breeding performance, or experimental readout, to name a few examples. Identifying genetic drift relies on colonists and researchers to first notice phenotypic change, and second, to do something about it. For some strains, comparison to baseline characteristics may help. The Mouse Phenome Database may have such information, which is searchable by strain or phenotype and includes all data collection protocols (phenome.jax.org). 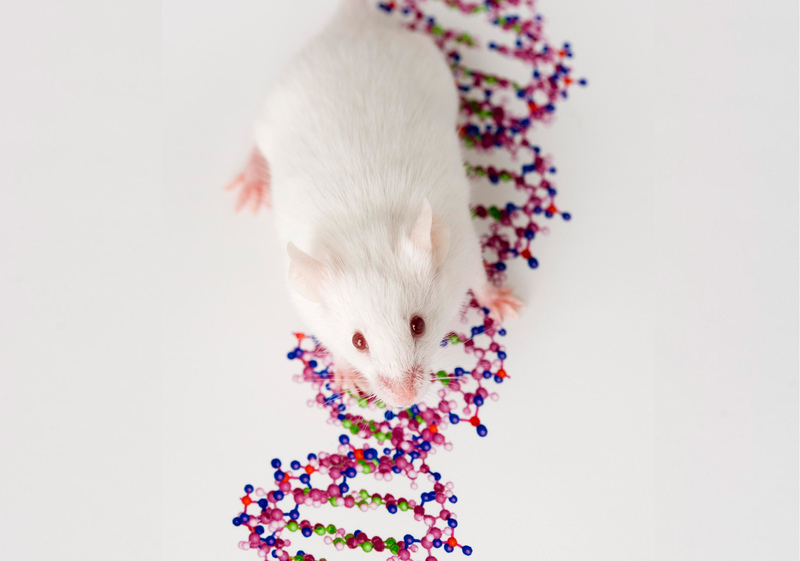 How many mice are affected and can they be traced to any particular cage or pedigree? How many years or generations has the colony been in the facility? When was the last refresh (see below) and what was the source of mice used? Without careful colony notes or reference data, it may be impossible to determine whether a phenotype has changed.